Private Robertson, from Medicine Hat in Alberta, was serving with the 27th Battalion Canadian Infantry (Manitoba Regiment) when he was killed on 6th November 1917. He was aged 35. Private James Robertson is buried in Tyne Cot cemetery at grave reference Plot LVIII, Row D, Grave 26. Cross of Sacrifice at Tyne Cot Cemetery. 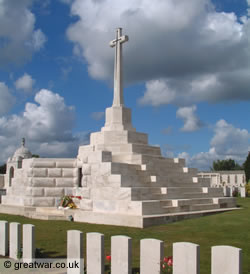 See our page about Tyne Cot Cemetery, the largest British military cemetery in the world.